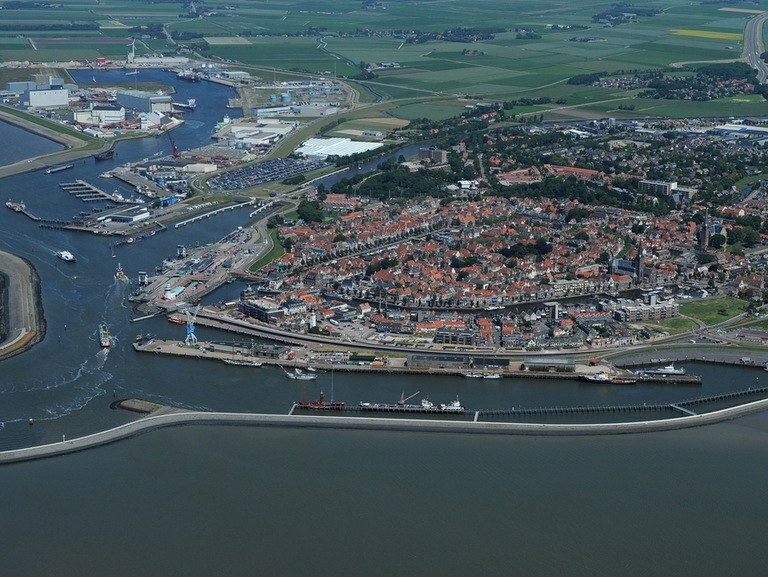 Harlingen harbour, which is located in the Dutch Wadden Sea, suffers from high annual sedimentation rates that entail high maintenance-dredging costs for the municipality of Harlingen. To reduce these costs and take appropriate mitigation measures, Harlingen municipality would like to know what processes drive siltation. In this exploratory study, the relative contributions of the those processes are being quantified using a numerical model. For the purposes of R&D, this exercise was later repeated (for hydrodynamics only) as a pilot application for Delft3D Flexible Mesh (Delft3D FM) – a new software engine for hydrodynamic simulations on unstructured grids. The physical processes that drive harbour siltation are tidal filling and emptying, horizontal eddy circulation in the harbour mouth and density-driven vertical circulation. The objective of this study was to quantify the relative contribution of these processes, and in particular the role of freshwater discharges into the harbour. This knowledge was then used to generate possible ways of reducing annual sedimentation volumes. We set up a three-dimensional Delft3D 4.01 (structured) model for Harlingen harbour that was included in the regional Delft3D 4.01 model for the Dutch Wadden Sea. The model was then used to analyse the role of tidal filling, horizontal eddy circulation and density-driven vertical circulation for two harbour geometries and a range of freshwater discharge scenarios. The analysis indicated that (1) tidal filling and emptying and (2) density-driven circulation are the dominant sedimentation mechanisms. The effect of the first mechanism can be mitigated by reducing the area of the harbour basin, a costly measure that is at odds with the ambitions for the harbour. The effect of the second mechanism can be mitigated by reducing freshwater discharges into the harbour. This is a more promising and realistic possibility and it has helped the municipality to further investigate mitigation measures in this direction. Due to its complex harbour geometry, Harlingen is likely to benefit from the use of unstructured grids in Delft3D FM. For R&D purposes, Harlingen was selected as a pilot case for an investigation of the performance, flexibility and efficiency of the new engine by comparison with a curvilinear Delft3D 4.01 model (based on hydrodynamics only). To this end, two Delft3D FM models were set up: (1) an identical grid to the curvilinear Delft3D grid and (2) a flexible mesh grid. The latter makes optimal use of the advantages of Delft3D FM, reducing the total number of grid cells by about 40% and providing a better distribution of high-resolution grid cells in the area of interest. The results are a good match for the various models for tidal signal, eddy circulation and vertical salinity distribution. Delft3D FM would therefore appear to be a promising tool for future harbour studies.